4銆佺數璇?#37719;?#37510;佽揣甯?br /> *?#25976;璇?#37719;?璐?#27996;?#23075;?#28729;?#38171;?#37713;?#28052;?#37711;?#32459;?G淇?#37721;?#38171;?#23536;?#28103;?#37711;嶆?#20352;噺锛?0鍒嗛挓?#23875;灏?#37510;?#37733;藉?#21620;А?#29831;?#29840;?#38171;屾ПТ鍗?#37719;?#37922;?#38171;?#28051;嶅埌30鍧?#37510;傝喘涔?#23059;?#38316;?#38171;?#26891;炵尓- 瑗?#28729;?/span>浼?#29723;屾梾?#29238;涓撹惀搴?#37510;?br /> *?#25571;甯?#38171;?#38171;?鍖椾含 锛夐渶?#24385;鍓嶈嚦涓?#37733;?/span>閾?#29723;?#26864;?#32510;?#37711;戞崲锛?澶?#37711;戞崲浜?100澶?#27996;烘皯甯?#38171;?40涓囧嵃灏?#37929;?#38171;?#29723;?#32459;嬬粨鏉熷悗杩樻湁110涓囧嵃灏?#37929;?#23480;?#37721;?#37510;傚?#25118;崲?#32139;澶йщ渶鍑?a href="http://www.mafengwo.cn/travel-scenic-spot/mafengwo/21536.html" target="_blank">涓?#37733;?/span>閾?#29723;?#37719;бц垨鐜伴噾鍙婅韩浠?#29831;佸?#25118;崲銆? *padang padang娴?#23114;?鎬讳綋?#32221;灏?#38171;屼篃鏈?#28051;А浜?#37914;村瓙锛屼絾?#27128;姣旇緝涔?#23480;?#38171;?#28051;嶄細鏉?#37814;?#27996;?#28051;滆е┐锛?#23480;?#28186;зч爞鐮捐緝澶?#38171;?#37721;充晶?#29214;鐮捐緝?#31887;锛屾?#38155;氮鏈?#27996;涘дз锛?#38338;?#32449;?#28598;?#22994;?.5涓囧嵃灏?#37929;?#38171;?#29825;?#28051;嶅дк娓?#27996;?#38171;屾А讳箣寰堝皬寰?#28186;?#28729;?#38171;屼汉寰?#28598;?br /> * ?#22142;宸村Е░ 娴?#23114;?棰?#28729;氱殑 ?#22142;宸村Е░ 鏅оц媺 鐜涘笗杈?#38320;?#25652;?Pramapada Hotel Jimbaran) 璺?#32450;绘捣婊?00绫?#23480;?#37721;?#38171;岃秴绾?#26473;?#38171;屽綋澶?#37827;?#38016;芥椂?#26879;18:30锛?#37930;?#37714;?#27996;?#29906;?#32519;庣殑鏃еш惤銆? Ø ?#22142;宸村Е░ 娴?#23114;?#38892;哄崸涓А澶?br /> 鐢?#27996;?#37715;?#28051;?#28598;?#23011;旇緝绱?#38171;?#29723;?#32459;嬭緝璧?#38171;屾渶?#24727;涓А澶?#37712;?#28729;氬湪?#22142;宸村Е░娴?#23114;?#37719;?#37706;?#28051;А澶?#38171;岀зЯ璧侀Бо闃?#28028;?#37510;佽?#28888;?#21613;苟涓嶈吹锛岃冻瓒宠汉浜?#28051;А澶? 鍥為緳瑙?闇嶈惀 鍐пф含锛?5801282705 锛?寰愭椽闇?#38171;?8611186273 锛? ?#31910;涓?#28000;?娉?#37928;?#37827;?#29863;?#38171;?#29825;?#29781;佹?#22904;噾 鍙嶈вл鎸佸垁瑕佹専锛圸T锛? 鍙?#37721;傝А?#37721;?#28051;А涓?#26916;?#38344;?#38171;?a href="http://travisgoodspeed.blogspot.com/2011/02/promiscuity-is-nrf24l01s-duty.html" style="box-sizing: border-box; color: #4183c4; text-decoration: none; background-image: initial; background-attachment: initial; background-size: initial; background-origin: initial; background-clip: initial; background-position: initial; background-repeat: initial;">Travis Goodspeed, 浣滆А?#28051;?#28000;呭梾鎺?#27996;?#32491;讳?#32937;殑閿?#37929;?Microsoft Comfort Desktop 5000), 杩樻紨绀?#27996;嗘А?#28052;?#37837;?span style="line-height: 25.6000003814697px;">鐢?#28000;栫殑涓А涓?#37721;?/span>GoodFET?#27537;璁?#28598;囧拰python?#27537;?#21116;鏈?/span>goodfet.nrf锛?span style="line-height: 25.6000003814697px;">?#24147;璁?nRF24L01+ ?#23025;?#22678;?#26814;鎺?2.4GHz ?#27537;鏁版嵁. 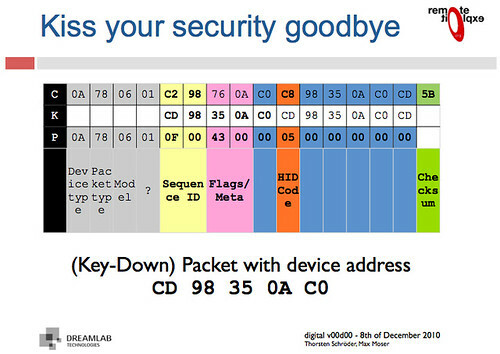 // decrypt those keyboard packets! of the KeyKeriki v2.0 project. Part 1: or, Why sniffing is hard. Part 2: or, Sniffing on the cheap. 杩?#37721;?#37712;?#27996;Оpreamble鍓嶇殑0x00锛?#28051;А鑸мх湪鑳屾櫙鍣кщ煶涓?#38000;?#28051;嶆槸鏀诲?#26127;А呯殑骞挎挱銆傚悗闈вtmd?#30149;鐪?#37811;?#38171;МThis does depend upon the preamble being preceded by 0x00, which occurs often in background noise but is not broadcast by the attacker. So the odds of receiving a packet, while significantly worse than we'd like, are much better than the 1/2^16 you might assume. In experiments, one in twenty or so real packets arrive while a significant number of false positives also sneak in. 杩欐о╡涔焧md涓嶇煡?#22669;浜?#37510;侫s low data-rate devices require significantly more time than high-rate devices to identify, such devices will either require undue amounts of patience or a real KeyKeriki. In the case of a Nike+ foot pod, I'm resorting to using loud hip hop music to trigger the sensor, which is left inside a pair of headphones. My labmates are not amused, but it is a great way to reveal the radio settings when syringe probes aren't convenient. Part 3: or, Sniffing a keyboard effectively. ?#30149;鐪?#37811;侫pplying an XOR to the proper region yields decrypted packets such as the following. 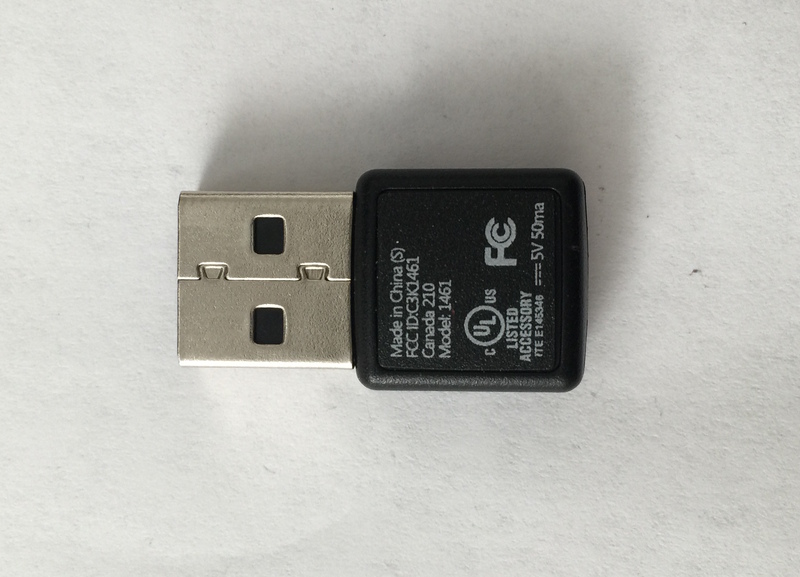 Because these contain USB HID events, key-up HID events quite often include long strings of 0x00 bytes. When XOR'ed with the key, those zeroes produce the key, so some packets contain the XOR key not just once, but twice! Finally, the USB HID events need to be deciphered to get key positions. 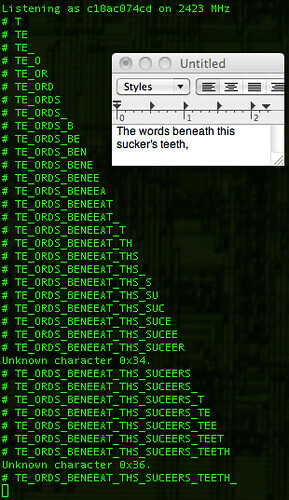 Mapping a few of these yields meaningful text, with bytes duplicated in the case of retransmissions and omitted in the case of lost packets. 绂佺敤鏍?#26976;?#28751;?#37711;佽о╕涓?#23534;冪殑鏁版嵁鍖?#26462;мц崲鎴?#28699;楄妭?#25930;璇пч殑鏁伴噺鏇村皬锛?#28003;?#37930;?#37812;?#29831;?#37724;嬬┐╗璇?#38171;?#38171;?#38171;岃А岃?#29115;釜搴?#37714;?#37721;?#28751;?#38339;叉нв閲?#37721;戠殑閿?#29722;?#37828;剧д║涓?#23046;?#37510;?#28051;嶇об鎬?#37837;?#38171;岀粨鏋?#26473;樻槸鐩稿綋?#32038;鑸?#27996;哄?#20906;殑锛?锟?amp;46@%#%……89&^%$鐪?#37733;?#37722;?#38171;岄╕Я璇?#37510;侱isabling checksums will allow the dropped packets to be converted to a smaller number of byte errors, while tracking sequence numbers will prevent retransmitted keys from being displayed twice. Regardless, the results are quite neighborly, as you can make out the sentence typed below in its packet capture. Part 4; or, Reproducing these results. 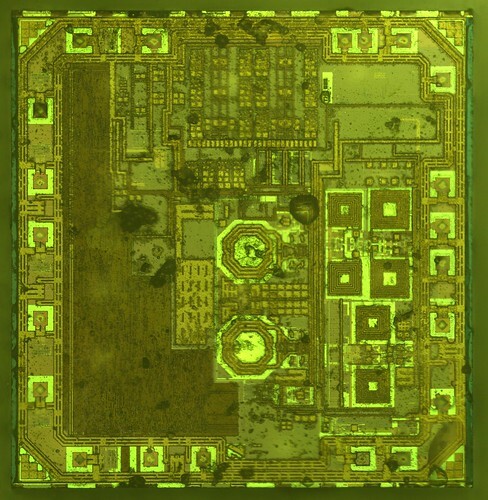 All of the code for this article is available in the GoodFET Project'srepository, as part of GoodFETNRF.py and its goodfet.nrf client script. The hardware used was an NHBadge12, although an NHBadge12B or a GoodFET with the SparkFun nRF24L01+ Transceiver Module will work just as well. To identify a nearby Nordic transmitter, run 'goodfet.nrf autotune'. 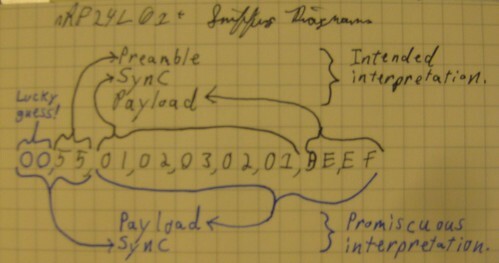 Keyboards can be identified and sniffed with 'goodfet.nrf sniffmskb', while a known keyboard can be sniffed and decoded by providing its address as an argument, 'goodfet.nrf sniffmskb aa,c10ac074cd,17,09'. The channel--0x17 in this case--will change for collision avoidance, but channel hopping is slow and resets to the same starting channel. Identification of the broadcast channel is faster when the receiver is not plugged in, as that causes the keyboard to continuously rebroadcast a keypress for a few seconds. All code presently in the repository will be refactored and rewritten, so revert to revision 885 or check the documentation for any changes. Contrary to prior belief, the nRF24L01+ can be used to promiscuously sniff compatible radios, allowing for keyboard sniffing without special hardware. It's also handy for figuring out the lower levels of the otherwise-documented ANT+ protocol, and for reverse engineering vendor-proprietary protocols such as Nike+. Additionally, it should be emphasized that the security of the Microsoft keyboards in this family is irreparably broken, and has been since Moser and Schröder published the vulnerability at CanSecWest. (It's a shame, because the keyboards are quite nicer than most Bluetooth ones, both in pairing delay and in battery life.) Do not purchase these things unless you want to broadcast every keystroke. While I have not yet written code for injecting new keystrokes, such code does exist in the KeyKeriki repository and would not be difficult to port. 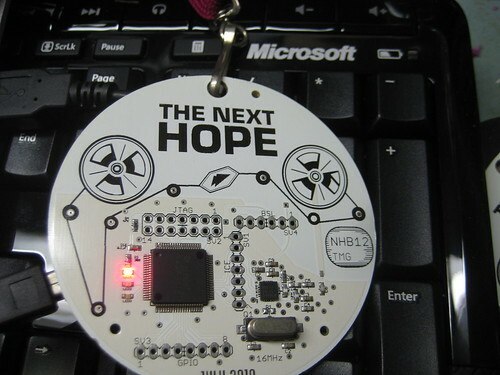 Perhaps it would be fun to build stand-alone firmware for the Next Hope badge that sniffs for keyboards, broadcasting Rick Astley lyrics into any that it finds? Please, for the love of the gods, use proper cryptography and double-check the security your designs. Then triple-check them. There is no excuse for such vulnerable garbage as these keyboards to be sold with neither decent security nor a word of warning. OsmocomBB?#27128;鍥?#28598;?#28051;А涓?#23534;А婧?#26916;?#37929;?#38171;屾槸GSM鍗?#29825;?#37837;?Protocols stack)?#27537;寮А婧?#28729;炵幇锛?#37711;?#32457;版槸Open source mobile communication Baseband.鐩оч殑?#27128;瑕?#28729;炵?#29256;墜鏈虹лп浠庣墿鐞嗗眰(layer1)鍒發ayer3?#27537;涓夊眰瀹炵幇銆?